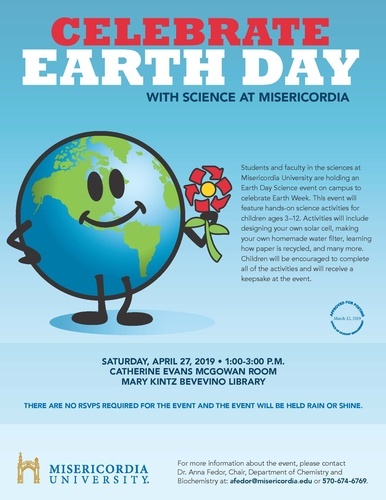 Saturday, April 27, 2019 1:00-3:00 p.m.
Students and faculty in the sciences at Misericordia University will feature hands-on science activities for children ages 3-12. Activities include designing your own solar cell, making your own homemade water filter, learning how paper is recycled, and many more. No RSVP's are required. Event will be held rain or shine. Open to the public. Click here to view the detailed flyer!